An estimated 200 million people worldwide use illegal drugs, according to a new study. The health consequences of this use are wide-ranging, researchers report this week in The Lancet. 14 million to 21 million use cocaine. In addition, 11 million to 21 million inject drugs. An estimated 15 million to 39 million are considered problem drug users, the article notes. Illegal drug use is highest in developed countries, the researchers found. They point out that many people who use illegal drugs take more than one drug. The major adverse health effects of marijuana are dependence, and probably psychotic disorders and other mental disorders, the researchers conclude. They say that marijuana is unlikely to be deadly. Drugs caused 2.1 million years of life lost in 2004, followed by alcohol, which caused a loss of 1.5 million years, according to the World Health Organization. Drug-related deaths tend to strike younger people, accounting for the higher number of years of life lost compared with other causes of death. 2.25 million due to alcohol. Cigarette smoking is the leading cause of premature, preventable death in the United States. Each year smoking causes an average of 438,000 deaths from cancer, heart disease, stroke, and lung disease, according to the National Cancer Institute. For years the conventional wisdom in smoking research was that smokers don’t show signs of daily cigarette addiction until adulthood. But at the School of Nursing, Professor Carla Storr, ScD, RN, is shedding light on the fact that nicotine addiction can start well before smokers are old enough to legally buy cigarettes. Intervene Early To Prevent Smoking. Extracurricular activities, such as sports, band, clubs, and dance lessons, are an important part of growing up for millions of American teens. 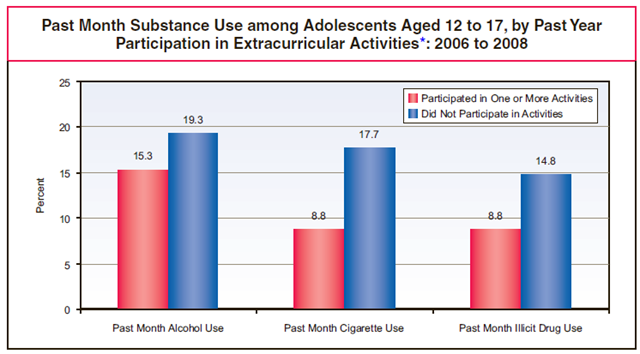 These activities promote physical fitness, intellectual growth, and social interaction, and have been associated with higher self-esteem, better academic performance, and improved interpersonal skills.1 The latest findings from the National Survey on Drug Use and Health (NSDUH) indicate that 22.4 million adolescents aged 12 to 17 (89.3 percent) participate in extracurricular activities and that those who participate in these activities are less likely to have used alcohol, cigarettes, and illicit drugs in the past month. In particular, adolescents who participated in these activities were half as likely as nonparticipants to have smoked cigarettes.